We consult for a number of cleantech businesses, providing digital strategy, branding & development and, while this particular idea doesn’t apply to us, we really loved the concept behind it. Matthew Anderson is a typographer at 350.org, a grassroots climate advocacy group and knows that fonts can cost a lot of money, and when small voluntary groups or local campaigners want to design a poster or leaflet that stands out, they often find the cost of modern typefaces is prohibitive. 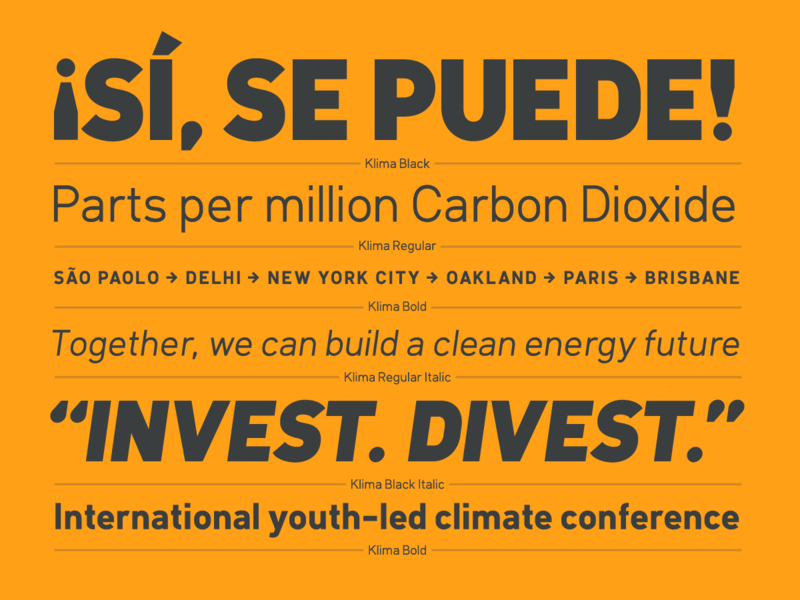 That’s why he designed Klima, a free typeface for the climate movement. One of the recurring failures of cleantech branding is a self-perpetuating adherence to an imagined treehugger aesthetic and cheap stock photography. If I had a penny for every cleantech company using a photograph of a pair-of-hands-holding-a-tree or lightbulb-with-a-leaf, I’d have enough for a Plumen lightbulb. The climate and, by relation, cleantech, is not about hippies anymore; it’s a multi-billion industry with advanced engineering and a responsibility to its shareholders and, as such, it’s never been more important to take cleantech / climate branding more seriously. As competition increases in the sector, the need to differentiate your cleantech brand from your competitors will become even more important. That’s why we like Matthew Anderson’s recognition that, even at a grassroots level, the image you present affects the way people view you. It’s available in three weights to download & use for free on non-commercial projects only.